Are citizens to be left on hook for clean up? The Chair of the Environment Committee Anna Lo has asked whether the ratepayers of Londonderry and Strabane are going to be left on the hook for the extra cost of hiring a specialist firm to manage waste and rats at the former Brickkiln plant in Maydown. The waste site closed during the summer after the company was forced into administration. The directors said the situation was effectively forced by the Council cancelling payments for a contracted disposal service from April 2015. The Council said it was forced to suspend payments to Brickkiln as it had failed to fulfil contractual obligations as set down in contract specification. In the aftermath came rats, waste and odours. Now the Stormont Environment Committee has asked if the citizens of Londonderry and Strabane are going to get any help in cleaning up the mess. It’s asked Departmental officials to investigate. Ms Lo provided members with an update from officials at a meeting of the Committee last week. 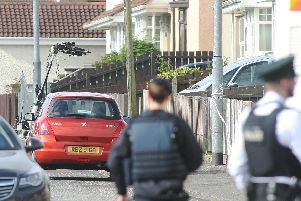 The update was in response to a query raised by DUP MLA Gary Middleton at a previous briefing in September. “The Department advises that the Northern Ireland Environment Agency (NIEA) continues to inspect the site and is liaising with the administrators to ensure that the waste will be managed properly. Last month the director of Brickkiln, Tommy McGlinchey, told the Sentinel that the Council’s decision not to pay for the contracted disposal service meant the waste on-site would likely be landfilled by any prospective new owner as there would be no contractual requirement under the terms of sale of the Maydown site to dispose of the on-site waste via energy recovery. He said this would negatively affect the new supercouncil’s energy recovery targets. The Council said that following the NIEA’s suspension of the company’s waste licence on July 10, Council has been working to resolve processing issues at the facility.